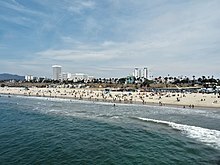 Santa Monica is a beach town in California. It is next to Los Angeles, California, US. It was made a city in 1886. In 2000, there were 88,050 people living there. It is famous for the Santa Monica Pier that has many fun rides. This page was last changed on 22 July 2018, at 11:59.